In response to the terrible Camp Fire in northern California, which has destroyed thousands of homes and leveled entire communities -continues to burn as this is written- Sierra Nevada Brewing Company stepped forward with a proposal to brew a beer and donate all sales to fire victim relief efforts. Similar collaboration benefit brewing efforts are not new to the California craft brewing community. Last year, after the devastating fires in Sonoma County, Russian River Brewing Co. enlisted dozens of craft breweries to brew Sonoma Pride beer. Their efforts helped raise over $1M for Sonoma fire relief. Similarly, just a few months ago, after the Carr Fire, five Shasta County craft breweries teamed up to raise funds by brewing Shasta Strong IPA. 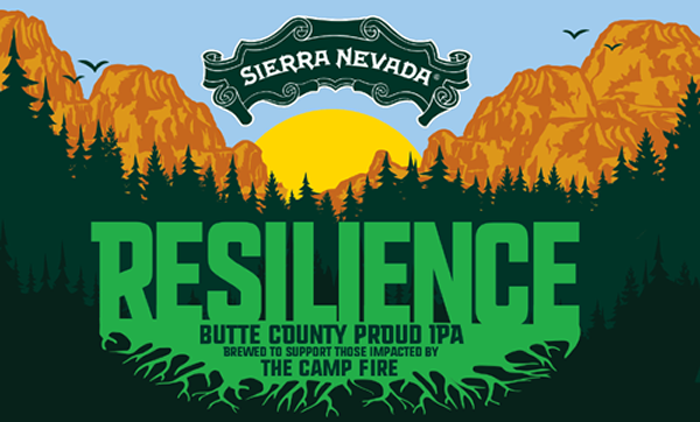 We are proud to announce that we’ll be brewing Resilience Butte County Proud IPA and donating 100 percent of sales to Camp Fire relief. In addition, we are also asking every brewery in America to brew Resilience and do the same. I’m sending a letter to brewers across the country, inviting them to join us in a collaboration brew day on Tuesday, November 27. We are working with malt and hop suppliers to provide raw ingredient donations to all participating breweries and are asking those breweries to donate 100 percent of their sales, as well. The response from the always close-knit brewing community has, of course, been tremendous and hundreds of breweries in California and further afield have signed on. Some of the Bay Area breweries that are participating are Danville Brewing Company, Del Cielo Brewing, Shadow Puppet Brewing Company, Ghost Town Brewing, Russian River Brewing Co., Altamont Brewing Company, Almanac Beer Co., Anchor Brewing Co., Drake’s Brewing Company, 21st Ammendment, Morgan Territory, …. There is a growing list of participating breweries on the Sierra Nevada webpage. In addition, the recipe for Resilience Butte County Proud IPA has been made available to homebrewers via the AHA, and homebrew supply retailer MoreBeer! may (emphasis on may) be releasing a homebrew ingredient kit. Homebrewers, who of course cannot sell their beer, are encouraged instead to make a donation for Camp Fire relief via the Golden Valley Bank Community Foundation. 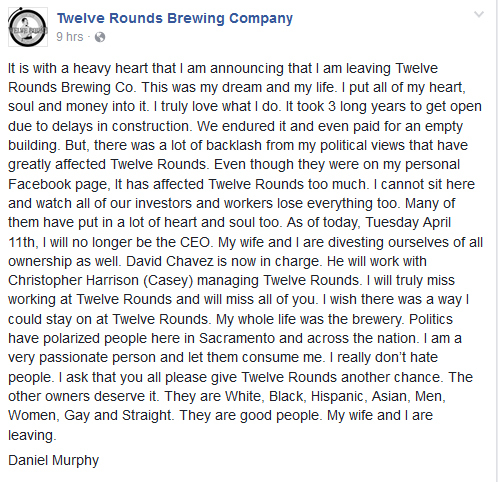 Today, Daniel Murphy, co-owner and founder of Twelve Rounds Brewing Company in Sacramento, announced on the brewery’s FaceBook page that he is stepping down as CEO of the company and that he and his wife, Elle Murphy, will be divesting from the brewery. As you may recall, Murphy drew much public ire (and some support) when he criticized the Women’s March on Washington on his personal FaceBook page, saying he was “disgusted” with those who supported that “divisive event.” That drew attention to previous posts on his page in which he reportedly made anti-gay and anti-Muslim statements and accused President Barack Obama off being some sort of crypto-Muslim and a promoter of hate. Those posting led to calls for a boycott of Twelve Rounds, and protests outside the brewery. Although early newspaper reports stressed that the taproom was full, and that many there expressed support for Murphy’s views, or at least his right to express them, it seems that that early surge did not hold up. Sure, he had many expressions of support from out of state, but out-of-state supporters don’t pay the bills. People in the taproom do, and Murphy had clearly alienated his home constituency. Despite an apology from him, the incident cost him clients and, ultimately, tap handles as bars and restaurants around town declined to serve his beer or to be associated with the Twelve Rounds brand. From what I’ve seen, the response on social media to his and his wife’s divesting from Twelve Rounds has, by and large, been one of “Seeya!”. Although I have no sympathy for his views, I feel bad for the Murphys. Opening a brewery is no easy or short process. It takes years of work and dedication. They poured their hearts and treasure into starting the brewery, and now they’re having to step away from it. At the same time I can’t but think what a rookie, dumbass move on his part, to lambast Muslims, gays, feminists, and liberals (In California!) when one is in a business that depends on making people feel welcome and included. And, especially in one in which so much depends on the brewers’ reputations and the customers’ relationship to them. In that sense, Murphy’s reaped what he sowed. I just hope that the brewery can shake off the controversy and that the workers and partners that remain can make a go of it. 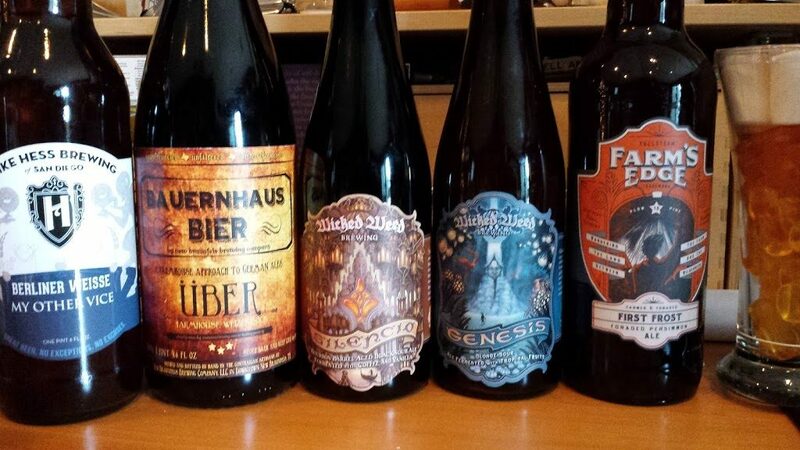 Thanks to my wife and kids, I’ve come away this Christmas with five exciting beers from under the tree: Mike Hess Brewing’s My Other Vice Berliner Weisse (San Diego, CA); New Braunfels Brewing Company’s Bauernhaus Über Weizenbock (New Braunfels, TX); Wicked Weed Brewing’s Silencio bourbon barrel-aged black sour ale, and Genesis blonde sour ale fermented with tropical fruits (Asheville, NC); and, Fullsteam Brewing’s First Frost foraged persimmon ale (Durham, NC). Those, and a beer glass filled with orange gummies, and vanilla marshmallows as “foam”! San Francisco, CA (August 24, 2016) – In a continued effort to preserve and protect California’s natural heritage, Anchor Brewing Company launches a membership drive for the California State Parks Foundation (CSPF). In February of 2013, Anchor Brewing initiated a partnership with CSPF in conjunction with the release of Anchor California Lager®. A portion of the proceeds from the sale of Anchor California Lager supports conservation projects in California State Parks that help enrich the state’s innate natural beauty. In the past year, Anchor Brewing has funded three important grants distributed by California State Parks Foundation. Expanding on this, Anchor is now hosting a membership drive for CSPF, encouraging the public to visit California State Parks and become a member of CSPF, helping their efforts to preserve and protect state parks. Anchor has also recently funded three important CSPF grants, benefiting Citizens for East Shore Parks, Jack London Park Partners and Santa Barbara County Trails Council. Citizens for East Shore Parks is funding a study on land birds and their habitat in the Albany Bulb, a historically and geographically significant parcel on the East Bay shoreline. The study will advise and guide the Albany Bulb Transition Plan’s habitat and wildlife conservation and restoration goals as the area becomes part of McLaughlin East Shore State Park. It is expected to be completed by late summer 2016. The Jack London Park Partners grant will help update and modernize The House of Happy Walls Museum, which serves as the main visitor center and museum for the park. It was built by Charmian London, as a memorial to Jack London and contains artifacts and mementos attesting to this world famous author’s literary success and adventurous lifestyle. The project is anticipated to be completed by November 2016. Finally, the Santa Barbara County Trails Council will add an entrance sign, kiosk, trail markers, and maps for a significantly underutilized area of El Capitán State Beach, improving access to the land. The grant will have a direct impact on visitors’ experience and as it was just awarded work is expected to begin immediately. In addition to fundraising efforts, Anchor employees have joined CSPF staff for Anchor volunteer days at California State Parks, which have helped to support conservation projects at Fort Ross, Half Moon Bay, Candlestick Point and China Camp State Parks, with additional projects planned in the future. Actively embracing California’s brewing traditions, Anchor California Lager is a re-creation of a historic beer; the first genuine lager brewed in California. The label features a California Grizzly Bear, an icon for the state, as well as California State Parks. CSPF works to provide care for the state’s 279 parks and ensure that everyone is able to enjoy these national treasures. In this way, California’s enduring natural heritage is celebrated and protected. Join Anchor Brewing in supporting the California State Parks Foundation by becoming a member today. The drive runs through September 30, 2016. The CSPF will be onsite to sign up new members. Sign up and receive $5 off of membership, and a free copy of the CA State Parks Hiker’s Guide. Anchor Brewing will also be offering deals on pints and growlers of Anchor California Lager, and will donate $1 to the CSPF for every pint of Anchor California Lager sold at the event.